Can anyone advise if these two cemteries are one in the same? Thanks. Fought in battle of King's Mountain, and with Indians at Hightower. 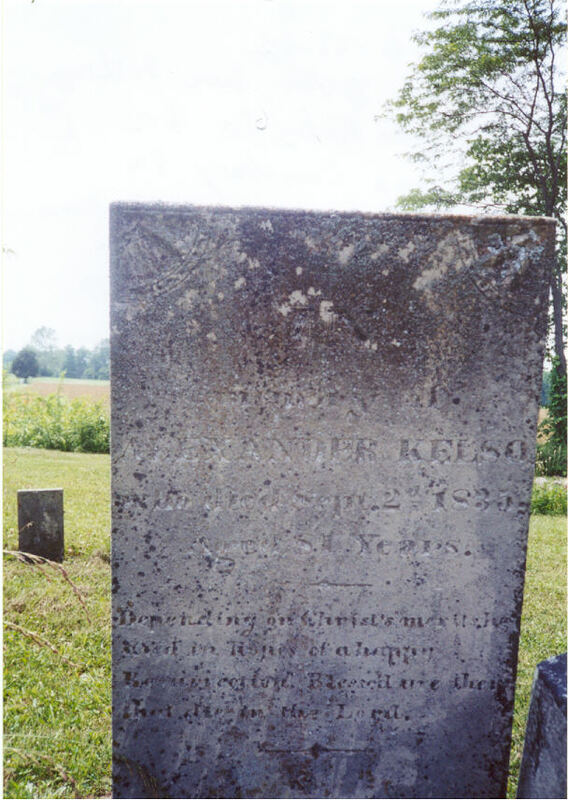 The shifting boundaries of the young US is evident when it is realized that all six of the Kelso children were born at the exact same geographical location on the banks of Kelso Mill Creek, four miles upstream from the present site of Dandridge. Alex and Hugh Kelso built a grain mill there in 1796 that was still standing in 1929. The site is now submerged under Lake Douglas. 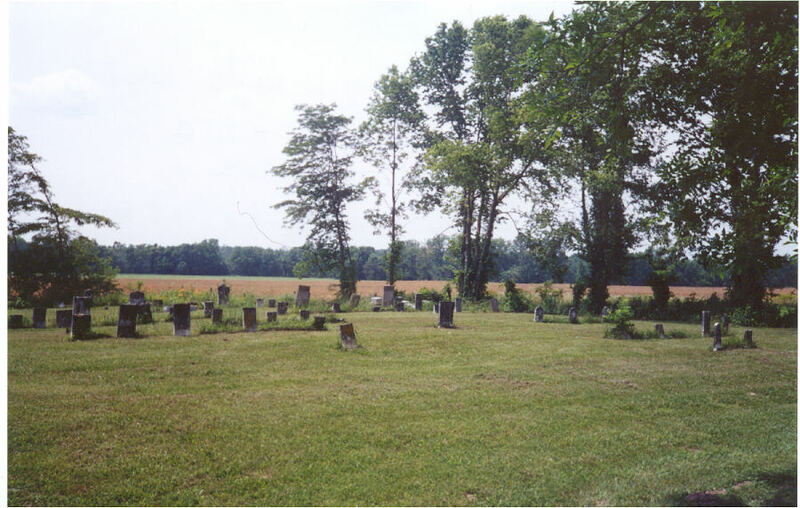 The family moved to Morgan Co., IN in Dec. 1828 because of its opposition to slavery. Married May 1781 in Jonesborough, Washington Co., TN; then NC, daughter of JAMES BALCH and ANN GOODWYN. She was born 1752 in Deer Creek, MD, and died May 05, 1847 in Morgan Co., IN. Notes on Margaret: Margaret only learned to write her name after age 85 while her grandchildren were learning to write theirs. When she first applied for a pension in 1835, she signed her name with an "X". When she reapplied five years later, she carefully spelled out each letter in her name. Born: 1787; d. 1859, Morgantown, IN. Died: September 26, 1843, Trafaler, Morgan, IN. Mary and James were 2nd cousins. 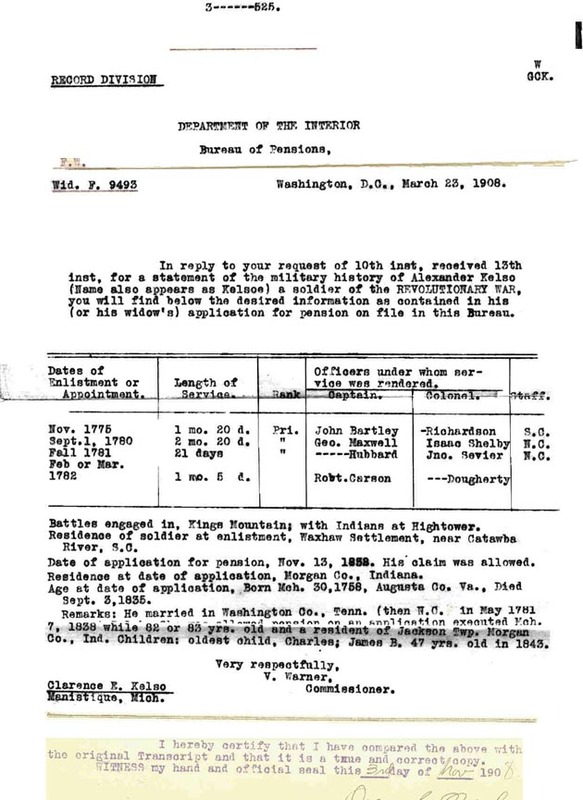 Called III by his descendants, shows in records as jr. On 23 April 1830 James purchased 30 acres from the US government in Morgan Co., IN. He built a corncracker in the early 30's on the creek west of town that was operated until it was abandoned about 1840. In 1842 he sold 80 acres to Evan Reynolds for $400, but died before final payment and transfer of title. Evan sued the heirs for the title. 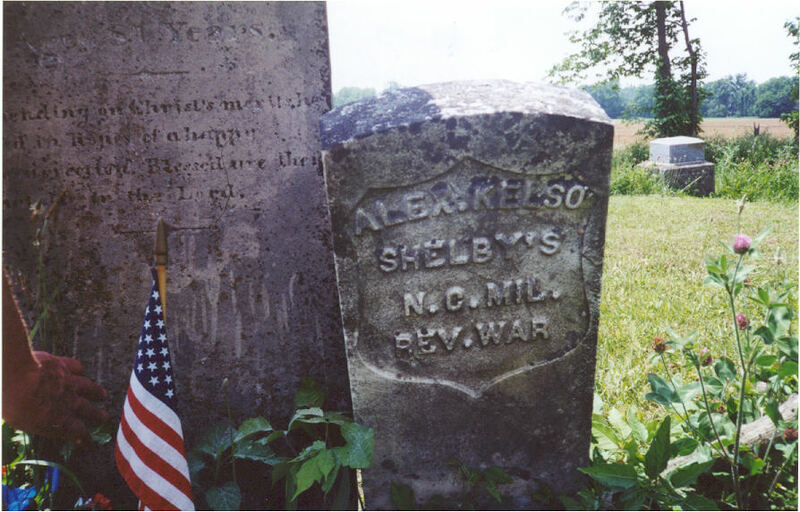 VELVA (MELVEY) KELSO: Born 1790, Washington District, NC; m. UNKNOWN MONDS. ANN GOODWYN KELSO, b. 1793, Jefferson Co., TN. Notes for ANN GOODWYN KELSO:Never married. Died: October 04, 1838, Knoxville, TN. Lived in Knoxville, TN during a fever epidemic in 1838 when he and four members of his family died. Fought in the Battle of New Orleans under Andrew Jackson. Malvina and Lewis Hudiburgh were half brother and sister. State Road 252, 7/10 of a miles west of Morgantown, from intersection of State Road Hwy 135 aand Hwy 252 in Morgantown, Indiana. The cemetery is on the right side of Hwy 252 going toward Matinsville. Thanks to Charles Brummel for providing new information about the family and military service of this patriot. Directions and Photos courtesy of Edward Hitchcock, member of the Daniel Guthrie Chapter SAR, Bedford, Indiana.